Today i will come up with another article where i can showing the commands used in Cisco IOS and Juniper junos. 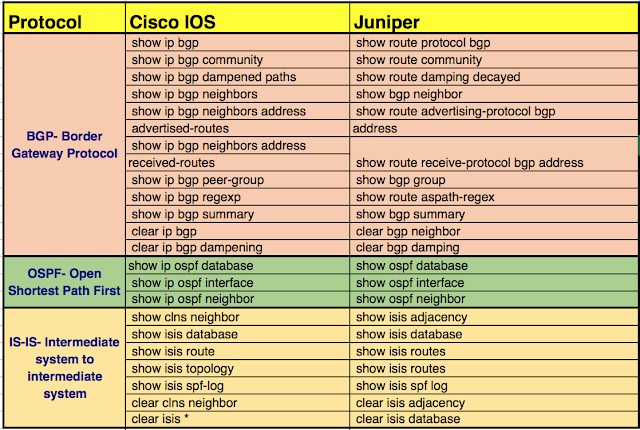 As we are taking some of the commands used for BGP-Border Gateway Protocol, OSPF- Open Shortest Path, IS-IS (Intermediate system to Intermediate system) and some of the common other commands showing difference in Cisco IOS and Juniper Junos. There are so many Enterprise network where you have Cisco as well as Juniper router work together. I knew there are some of the instances where we are using Huawei, HP and Brocade routers as well but here in this article i am only talk about the command difference in Cisco and Juniper. Below table shows the command difference in Cisco and Juniper ( for BGP, OSPF and IS-IS protocols only ). These commands are only the show commands for troubleshooting. I will soon come up with another article where i can show up with the configurational commands for these protocols in Cisco IOS and Juniper Junos. 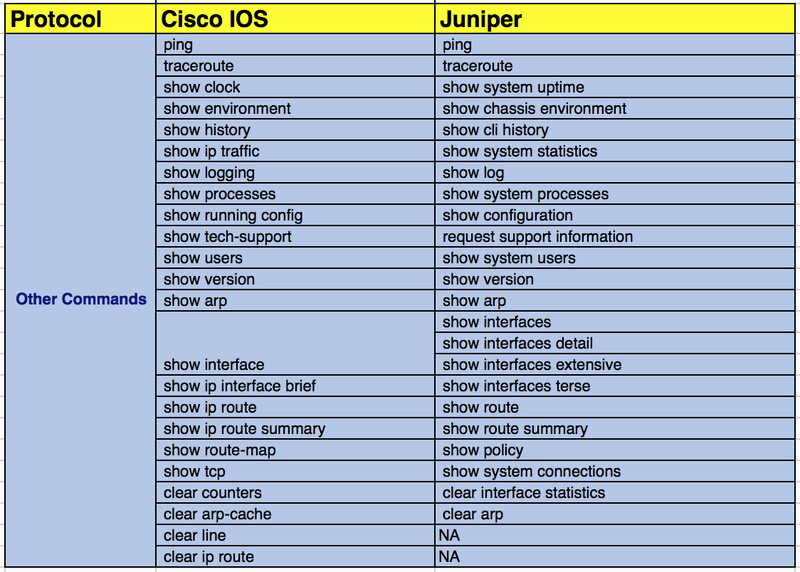 So you have now healthy idea to distinguish between the command difference between Cisco and Juniper. Some of the Enterprises uses Cisco and Juniper in Core backbone for the high backplane bandwidth and due to these reasons you can use the protocol which is standardised by IEEE. These are the reasons when you can't use EIGRP, IGRP protocols as they are Cisco propriety Protocols. Few months back, Cisco said that EIGRP is open protocol now but it is not used in Juniper routers so you can't use this protocol. Some of you also wanted to know the command difference between Cisco and Huawei or Juniper and Huawei. I will also come up with that article soon. Below table is the command difference for some of the useful operations on the routers like ping. Above mentioned table shows the basic commands to troubleshoot the routers as the time of the issues in the network. Stay connected will come with the other command differences soon.